Problem: You cannot view any system or hidden files in Vista’s C:\drive. 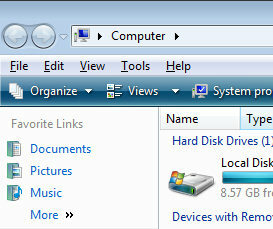 Moreover, when you launch Vista’s Explorer you cannot find the Tools menu to change these file settings. Solution A: Vista’s new way is to begin by navigating to the Control Panel. Select the Appearance and Personalization section, from there, Folder Options –> Show hidden files and folders. 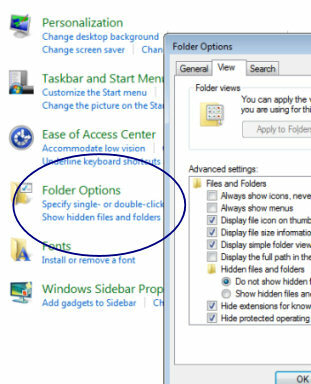 What you should now see is the familiar Windows menu called Folder Options. Click on the View tab and then scroll down to Hidden files and folders. Select the radio button next to Show hidden files and folders. While I am at these advanced settings, my preference is to remove the tick next to ‘Hide protected operating system files’. Above is a screen shot of the Vista Control Panel featuring the Hidden files and folders settings. Solution B: Launch the Vista Explorer (Windows Explorer and not IE7). What I do is press the Windows key + e. Now press just the Alt key. Magically, the Alt key causes the old File Edit View Tools menu to appear, under the Tools menu you will find the Files and Folder settings with the View tab. Above is a screen shot after pressing the Alt key in Vista’s explorer. While finding the Files and folder settings is a relatively trivial task, it gives a glimpse that increased security impacts every aspect of Vista. Another point that I would like to make is that the Control Panel has grown in importance and consequently has a modified layout compared with XP. By default Vista’s Explorer does not display system and hidden files. Probably for security reasons it’s not as easy to show these files as in XP. Fortunately there are not one but two solutions. Either go to the Control Panel or simply press the Alt key when the Windows Explorer is in the foreground.